With a slew of reasons from dairy allergies and intolerance to lactose, to an interest in healthier, more environmentally friendly drinks, there seems to be a new variety of milk around every grocery store isle. But if you have no personal or nutritional preferences, do you really need to make the switch from plain ol' cow's milk? And if you do have dietary restrictions, which is the right substitution for you? To break it down, one 8-ounce glass of 2% cow's milk has 120 calories and 4.5 grams of fat. This traditional type contains several important nutrients, including calcium for strong bones and protein for lean muscles, so be sure you still reap all those great health rewards. Alternative milks are free of lactose and casein, a protein that can disagree with many stomachs. Most types have less sugar (though some options may taste sweeter), fat and calories than cow’s milk (skim is an exception), and many are fortified and enriched with extra nutrients. Some of these new options can taste similar to the milk you're familiar with, while others will take on an entirely different flavor. Experiment with your taste buds and tummy by dunking an Oreo and topping your cereal with any of these varieties. Note: Nutritional information based off of one, 8-ounce glass, but remember that different brands may vary, so be sure to check the label! Commonly known as the first cow's milk alternative, soy milk is cholesterol free and high in protein to fight hunger. One cup contains 30 milligrams of isoflavones, which may help prevent cardiovascular disease and some types of cancer. 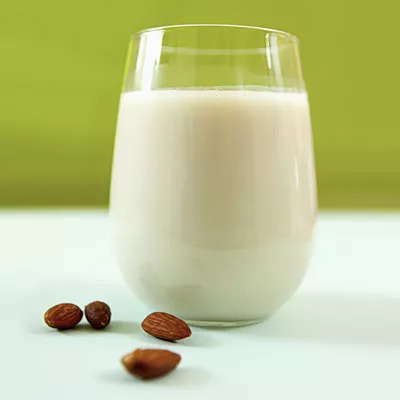 Almond milk is free of lactose, gluten, casein, and cholesterol. An 8-ounce serving gives you up to half your daily requirement for vitamin E—great for glowing, healthy skin! It has a creamy consistency and a mild, nutty flavor, but it’s not your best source of protein (only 1-2 grams per cup). This alternative contains omega-3 and omega 6 fatty acids that are good for your heart. It’s high in iron and calcium, and low in sodium, but this is another alternative that's low in protein. Milk made from rice is easy to digest, cholesterol free, and often fortified with extra vitamins and minerals. Some rice milk drinkers love the mild, sweet flavor, but it’s higher in sugar and it provides little protein. Oat Milk is cholesterol free, low in fat and higher in heart-healthy fiber than other milk alternatives, but be wary as some flavored varieties have a lot of added sugar.